I mentioned in a recent post that I sew in my Laundry room. With all the organizing going on around here, I thought I would clean up my space a little and give you a peek. I have a cutting table in the guest room, but this work fine for smaller projects or just trimming off excess. The bulletin board will soon be hung above my sewing table. Just by the door, I have a great cabinet that I bought at K-Mart several years ago. It used to be in my kitchen in our old house, and I could not bear leaving it behind. It works great for storing books, fat quarters, patterns and a few fun things too. I love this print. It's by Rebecca Barker with a great verse. "Let the Beauty of the Lord our God be upon Us and establish the Work of our Hands for Us. I'm joining the Pink Chalk Studio Where I Sew party. I thought I would join in the Summer Fair being hosted by the genX Quilters. In my neck of the woods, the county fairs are held in the winter time, so having a Summer Fair is a fun way to enjoy looking at quilts and recipes during these hot days of summer. Back in May I learned how to make the 10 Minute Block and posted about it HERE. There were blocks left over when I made a change to the colors used in the quilt. So I finished putting the left over blocks together for this table runner. If you are a new visitor to my blog, thanks for stopping by. I hope you will enjoy a Happy Quilting day! So I've been on a mission to get my stash organized! Not so that it looks pretty, but so I can find what I need!!!! Soooooo.................. I went back down to IKEA (love that store) and bought more! And my sweet college boy put them together for me yesterday. Now a word about the IKEA storage system. After I bought the first one I happened to go to the Big hardware warehouse and priced them there. Update - Joining Susan at Metamorphosis Monday! Pink Saturday and a Winner! I'm a Pinkaholic! Okay I admit it!! Every time I see something pretty in pink, well, I'm a goner. So today, just for fun, I thought I would link up with Pink Saturday. It's a blog party that's been going on for quite a while. 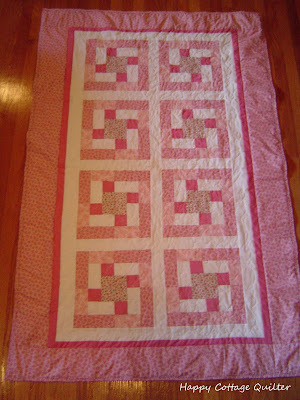 What could be better then a pretty pink quilt?? Why a winner, of course. Thanks again for everyone who signed up for the giveaway. I appreciate all the comments, and also appreciate everyone who has committed to making a quilt top for the people of Joplin. I know we all live busy lives, but when life comes to a halt, it's nice to know that there are people out there who will give a little of themselves. Here are the three quilt tops I've completed so far. These black and white blocks were made by Pat who writes the 501 Quilt Blocks blog. I used the blocks to create a quilt top. And this was made from one of the fabric bundles sent to me by the Joplin Quilt Project organizers marie-madeline studio. Thank you to all who have made the commitment to make a quilt top for those who have lost everything! I am so blessed to have a home, family, friends and the things in life that keep us going. I am linking with Quilt Story Fabric Tuesday. I received this very large box in the mail. Recently I won a give away from Renee who writes the beautiful blog Sewn With Grace. I really had no idea how many vintage sheets would be in this package, so to say that I was blown away is an understatement! Right now I am in Vintage Sheet heaven! It would have taken me forever to collect this many vintage sheets. And have a Happy Quilting Day!! Yesterday I visited one of our JoAnn ETC stores and spied these DS fabrics. There was still a nice selection of fabrics. So if anyone is still looking for the DS line and you are anywhere near the Brandon Florida area, they've got it! And I am so happy to see some of you gals are signing up to make a quilt or quilt top for the Joplin Quilt Project. If you need a reminder of how devastating this tornado was in Joplin, take a look at these PICTURES. Please remember to leave a separate comment HERE for an additional giveaway entry. Have a very happy quilting day! Have you seen it?? Have you seen all the places Where Bloggers Create?? Oh my!! Such beauty! Such style!! Such Organization!!!! I started to look at these blogs, and immediately was overwhelmed. I am generally not that organized (which is why I am trying to get my stash into the wire baskets). But these gals are amazing. Can you take a minute to look at a couple, like HERE and HERE. And then if you go to "My Desert Cottage", who is hosting the Blog party, go to her side bar and just start clicking. Karen actually has them listed in alphabetical order (organized!!!). Me, where do I create?? And don't forget to sign up for my giveaway. Five fat quarters, a quick and easy quilt pattern and ruler, and the Thread Bear tote! Be sure to sign up on yesterdays post HERE. Hello there sweet peeps! How was your weekend? It sure seems like the weekends go by so quickly. And can you believe that it is already the middle of JULY!!! Do you know that fall is just around the corner, and then you know what comes next!!! Yep, I've been working on the quilts for Joplin. I'm on my third quilt top to be sent to the Long ladies of marie-madeline studio in MO. They are working to get quilts to those who have lost everything during the recent and destructive tornado. You can check out the Joplin Quilt Project. Now last week I promised that if you followed along with me on my Shop Hop that I would be putting together a little giveaway. As you know, you can't go on a Shop Hop and not find some little treasures. I was happy to find some fabric I was looking for, plus enjoying all the eye candy and inspiration. I picked up these fat quarters for you, my sweet readers. And this quick and easy pattern and ruler. and I thought, why don't I make a little tote to put these goodies in? If you look closely you can see it is all sewing motifs. From a Debbie Mumm fabric line. We all love a Thread Bear, right? So what do you have to do to enter this giveaway? Just leave a comment on this post :-) And because I love my followers, you get a second entry. Just be sure to let me know that you are already a follower. And as an added entry, if you will contact the Long ladies, you can request a fabric bundle to make a quilt top for those who can really use it. Their goal is to distribute the quilts in the fall, when the weather turns cooler. So go to the Joplin Quilt Project and find out the details. Leave me another comment that you will commit to making at least one quilt top (or send a completed quilt if you like). This giveaway will stay open until Friday July 22, and I will post the winner on Saturday. Have a great quilting week! But once you step inside.......... oh my! what a treat! Do enjoy a Shop Hop? How about if you make your own Shop Hop? A couple of weeks ago, the quilting buddies did our own Shop Hop. Want to come along?? This is our first stop. I love to visit the Patchwork Pig because they always have so many new samples on display. Notice the black and white theme on some of these quilts? so you can see all these gorgeous fabrics on the wall. In the last month I've made two new tote bags. How about you? Do you make bags? ?